Welcome back to another edition of Sports Science Monthly. 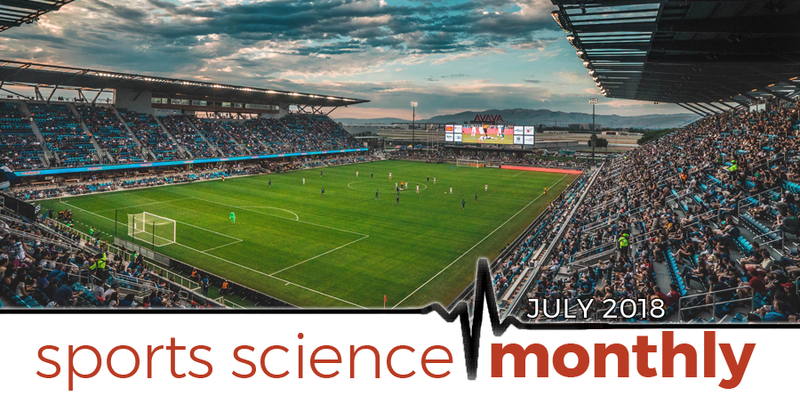 This month, we take a closer look at monitoring post-match fatigue, the debate on hamstring muscle action, mindfulness, warming up, travel, and more. » Quick summary: Monitoring for post-match fatigue in team sports is an idea with plenty of potential, but that is rife with practical limitations. In a recent paper, a group of leading sports scientists from soccer discuss some of these limitations – including the fact that increased post-match fatigue doesn’t necessarily correlate to decreased performance – in order to give us a better idea of how, and if, we should monitor for fatigue in sport. I’m often banging on about the need to monitor athletes in order to better understand how they are tolerating loads and recovery; however, a recent paper in Sports Medicine has given me plenty of food for thought. In this article – written by sports science and medicine staff from Paris Saint Germain and Arsenal football clubs and available in full for free – the authors discuss the real world application of these monitoring methods, as well as some contemporary issues regarding their use. I’m a big fan of one of the authors, Martin Buchheit, as he often puts a real-world spin on the theory, which often gets me thinking deeper about certain issues. The first point that the authors make is that the purpose of post-match fatigue monitoring is to collect measurements on fatigue, and then use this information to better manage player load in the run up to the next match. However, they point out that there appears to be no relationship between post-match fatigue measures and subsequent match performance; i.e., those players who exhibit the highest fatigue scores do not perform worse in the next match. If this is the case, they ask, why collect this data in the first place? Secondly, they review the literature supporting the use of post-match fatigue monitoring. In general, the research in this area is often not in elite football players, and the data suggests that, in sub-elite footballers, full recovery – in terms of return to baseline measures – tends to occur within 72 hours of a match. However, based on limited research in elite football players, the time course for recovery appears to be shorter in higher standard players, who are often fitter, with a suggested recovery time frame of just 48 hours. Thirdly, they ask just how practical the collection of post-match fatigue data is. Typically, the day after a match is a recovery day, and so players may not be present at the club in order for the sports science and medicine staff to collect data on recovery at the 24 hour time point. Additionally, for evening games, the 24- and 48 hour post-match measures would need to be collected at 10pm, which is clearly impractical; collection of data at standardized times is important to allow correct interpretation of the data, so it isn’t necessarily a case of just altering the data collection times to fit in. The relevance of the data that is collected is also questioned; during a period of heavy fixture congestion, when fatigue is likely to be highest, the players also have to adequately prepare tactically for the next match; as such, the manager will be demanding their presence on the training pitch, no matter what the fatigue status of any given player. Fourth, what data are you actually going to collect? As the authors point out, and as my limited experience supports, players tend to be reluctant to undergo blood or saliva tests, meaning that the sports science team are often limited to subjective markers, or performance on physical tests. The concept of subjecting players to a physical test to determine fatigue status is, however, questionable, given that such a test would likely invoke further fatigue, and hence be counter-productive. So what are the alternatives? The authors point to the need for future research supporting the use of “convenience data”, such as within-training heart rate or running metrics (most players train with either a heart rate monitor or GPS unit, or even both), which would allow for the development of a robust data set over time, from which individual deviations from a normal range could be detected – but even then, what would you do with such data? So what does this mean for you? Hopefully, it’s encouraged you to critically assess what you measure within your training – not just with regards to fatigue management, but also performance. Are you collecting data that matters – i.e., can you make interventions based on it, and is it reliable for the group of athletes you’re working with? Such considerations are important from an efficiency stand point, and, if your athletes understand why and how you use the data you collect, could ensure a greater buy-in on their part.